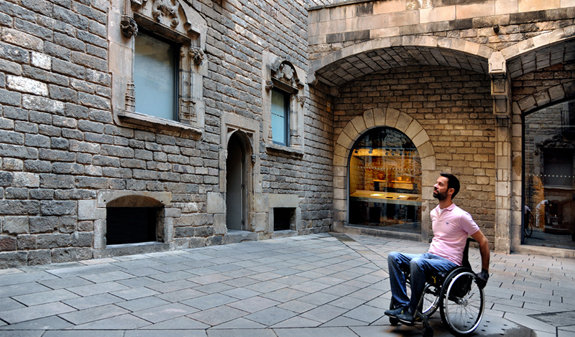 If you have reduced mobility (because you walk with a stick, have to get around in a wheelchair, or become tired when you stand for a long time...) but you don’t want to miss out on the activities the city offers, we’ve designed a route so you can discover the “heart” of Barcelona. An easy, convenient itinerary adapted to your needs! Itinerary: Plaça Sant Jaume, Carrer del Bisbe, Pla de la Catedral, Carrer dels Comtes, Plaça Sant Iu, Plaça del Rei, Carrer Llibreteria and Plaça Sant Jaume. Meeting point: Turisme de Barcelona Plaça Sant Jaume tourist information office. Carrer Ciutat. 2. The wheelchair accessible entrance is through the main door to City Hall. How to get there on adapted means of transport: Buses 45 and V17 (Via Laietana-Plaça de l’Àngel station), or Metro Liceu (L3). The nearest station, Jaume I (L4), doesn’t have a lift. * The days and times can be adapted for groups. Departures guaranteed. Pre-booking essential at least 24 hours in advance. Small groups (no more than ten people including companions). Please arrive ten minutes before the tour commences. Service providing personalized tourist information about Barcelona in several languages, by phone, fax and e-mail. We'll be glad to help you to book and buy tickets for tours, shows or other. Purchase on-line. BCN Shop: Virtual shop run by Turisme de Barcelona where you can purchase tourist products and services. Write the result of the calculation "1 - 8"